If you are bored of the usual paneer curries, then this curry - Shyam Savera can be a welcome change. The name literally translates to night and day as it offers. as is evident from the picture two contrast colours. Simply put, it is 'Spinach dumplings with a creamy cheese centre in a rich tomato gravy'. It is one of the favorite special curries in my household. Since, it require some time consuming preparations, it is reserved for special occasions. 1. Heat the milk in a deep pan and bring it to boil. When it comes to boil, add the lemon juice and stir. Remove it from it and let it sit for 2 minutes. The cheese will separate from the whey. Pour the mixture through a muslin clothe lined sieve. Squeeze out all the water out of the paneer (cheese) and let it cool to room temperature. 2. Once it it cooled down completed add the salt and pepper powder and mix thoroughly to get smooth texture to the paneer. Make 12-15 same size smooth paneer balls by rolling them in your palm. Set aside. 3. Blanch the spinach leaves by pouring very hot water over it. Drain and squeeze out any excess water. This step is very important. Then chop the blanched leaves finely. Add them in a large bowl and add salt and corn flour. 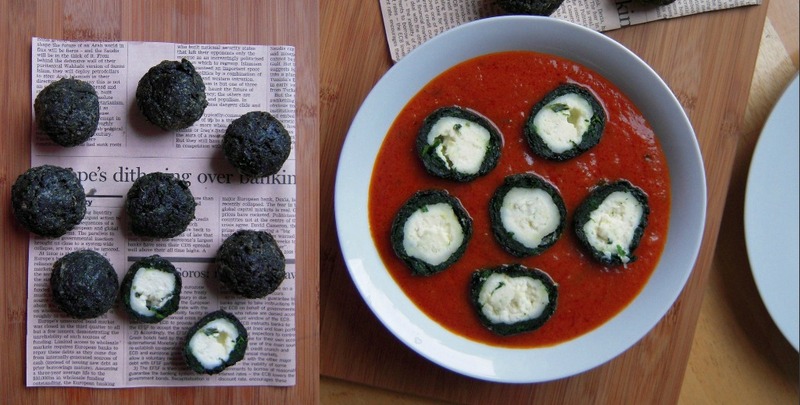 Divide the spinach evenly to cover each paneer ball with it. 4. Heat oil and deep fry them. Set aside. 5. To make the gravy heat oil in a pan. Add cloves, bay leaves, cinnamon stick, cardamom and cumin seeds and let it cook for a few seconds. Add garlic, green chili and onions. Saute them on medium heat until onions are slightly brown, stirring every couple of minutes. 6. Blanch tomatoes by adding them to very hot water and peel off the skin. Chop them into pieces. Add the chopped tomatoes, tomato paste and add all the spices except garam masala and continue cooking on medium heat onions and tomatoes mixture start leaving the sides of the pan leaving oil on the sides. 7. Now take the gravy off heat and churn it in a blender into a smooth paste. Take out all the whole spices before grinding. Put it back to the pan. Add water to get the desired consistency and cook for another couple of minutes. 8. Now add the garam masala and stir. Cook for a few minutes and then add cream and stir. Add handful of coriander. 9. Just before serving slit the Spinach Paneer Balls in half and place them over hot tomato gravy. Serve hot with naan, chapati or paratha. Enjoy! Wow wat a eye pleasing and super cathchy shyam savera, lovely dish. Saturday Snapshot ~ Munnar in God's Own Country!